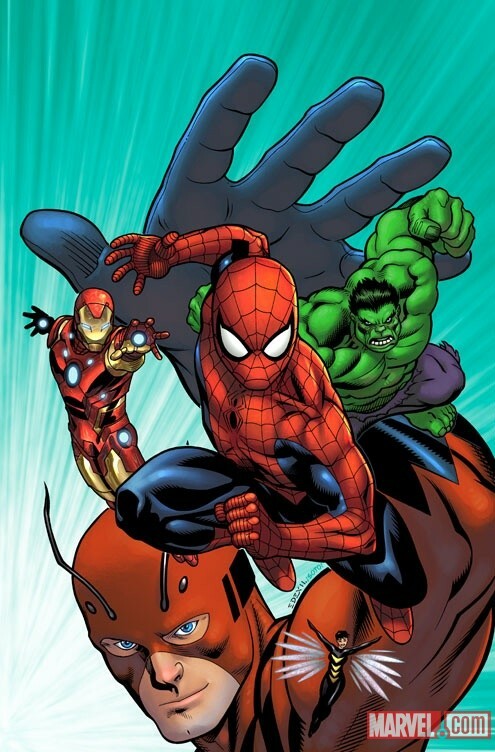 Spider-Man and the Avengers #1 is a new Marvel giveaway comic book available in-store from Williams-Sonoma. The 12-page comic was created to generate awareness for Share Our Strength, a charitable organization aiming to end childhood hunger. Written by C.B. Cebulski and artist Todd Nauck, the issue features appearances by Spider-Man, Captain America, Thor, Iron Man, Hulk, Giant-Man, The Wasp and the Avenger's butler Jarvis. The Frightful Four provides the villainy at a Share Our Strength cooking demonstration hosted by Jarvis. The heroes unite to do what they do best. To get a copy of the comic you must attend a cookie decorating demonstration featuring a new line of Marvel Comics inspired products. Your local Williams-Sonoma stores are currently offering demos for $5.00. The fee includes cookies and one copy of the Spider-Man and the Avengers #1 comic book. Beyond the new giveaway comic, Williams-Sonoma has some pretty awesome new products including my favorite -- Spider-Man Comic Book Cookie Cutters. The set includes 7 cookie cutter stamps that can be assembled to create a Spider-Man cover of your very own. Call your local Williams-Sonoma to get an appointment for some Marvel cookies decorating fun, as well as getting a copy of the new Spider-Man and the Avengers #1 giveaway comic. thanks for sharing this one, this is very interesting ,i like to contact the local willian sonoma asap... they have cool stuff.